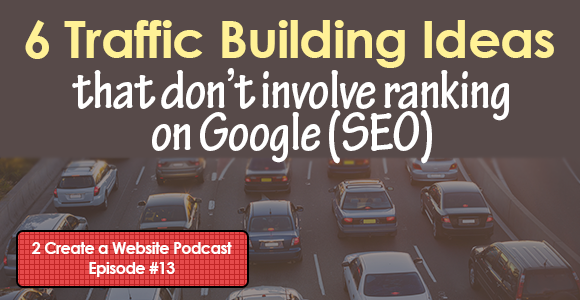 If you’re looking for ways to build traffic without Google, this episode will definitely fill your head with a handful of ideas you can try. If you’re a new site owner or blogger, you definitely can’t miss this one. I am so glad that someone like you can also help. The tip is very helpful. Please, can u help me create website/blog to sell my products online. I’ll be greatful if u can do that for me. Thanks for these ideas, my blog has been around awhile and I actually get traffic from search engines for targeted keywords since it’s seasoned, but not enough. The newspaper tip is a good one, I may tie it in with supporting some local fundraisers like ones I posted about previously. Hey Lisa! It is almost impossible to leave your site once I open it. I will definitely give the local exposure of my website a go. I’ve done this before when I worked for a local company, I contacted a women’s magazine and asked them to feature me on their “career of the month” corner. It is quite easy to get in. I’d assume that it is not so difficult with local newspapers as well, as long as your website is a fit for their audience. Would you recommend paid ads on local newspapers though? Never tried advertising with newspapers. It’s not really a good fit for what I sell but I can imagine it may work with certain niches. thanks for sharing these nice tips to us…. I am ABD, in the dissertation stage for my Doctorate in Global Business and I just wanted to say how much I enjoyed your pod cast. I recent launched Walters Global Business Resources, LLC to help businesses leverage technology to grow their business. I think you are a great resource, and I would love to collaborate with you. I am looking forward to shearing your information with my friends on Facebook, and also with my colleagues in higher education. I also have a website called “ShopFanStuff.com” where I have over 30,000 products for fans of sport teams including the NFL, NCAA, NBA, NHL, MLB, and NASCAR, with more sports to come. I really enjoyed your pod cast. It was really educative, love the aspect of the guest posting and how to go about it. I have tried the YouTube, but didn’t really work out for me, I guess it was because of the content and my consistency like you discussed. Anyway, it was a great pod cast.. Looking forward for more pod cast. Thanks Dok! I’ve got another one coming out next week so hope you get a chance to listen! Also thanks for the reply at the Udemy Spreadshirt Course. The reason why I Bail Out of Udemy is that they expect you to create a Video Course from SCRATCH on your own, any PLR related videos and subject are not allowed or approve. Anyway, please take care of your health and hoping you get well the soonest! Thanks William! My health is fabulous, thanks for the wishes. I’ll check into the download. First time here on your blog. I really enjoyed the tips you shared in your podcast. You’re absolutely right you can’t rely on Google alone for traffic you need to diversify. I like the reference to giving away a free course on Udemy. I recently touched on giving away your product for free in a blog post if you can’t get a sale. One thing to add to what you said about giving your course away for free is have people in your circle of trust consume the course and give you feedback first before offering the course. Ask them if they would buy it? What changes need to be made? etc. This way you know you can actually sell that course and make a profit down the road after establishing your brand. I love the subtle tip to pay attention to what comes up when you type in the search box on YouTube. This is an easy way to see what people are searching for. From there you can check out that content and possibly create a video better than what has already been created or address an issue that may be missing. Thanks for sharing Lisa. So great to have you here. Hope to see you in the comments more often. Yes! I’ve been trying to get people to move away from Google for a long time. I treat any traffic as a bonus. Thanks again for commenting and glad you enjoyed the podcast. Hi Lisa, Thank you for sharing this useful Post. Thank you for sharing useful knowledge, little question about visitor traffic. Do you think well, if the visitor traffic is more to come from referral sites like facebook? Instead of Google search results or other search engines. Thank You. Hi Lisa. This was a very educational podcast that I listened to while taking a walk, so I guess I was ‘studywalking’! It’s the best way to study. I had never heard of Fedora before but I looked it up and it lets you keep your course on your own website. I know you advise against free websites because you don’t control your content, but you’re OK with hosting your courses on an external platform such as Udemy, so I’m interested to know the logic behind your different stances in each case. I wouldn’t put Udemy in the same category as a free hosting site. First of all, even if they did somehow die or go away, I still have my audience and can sell my courses myself. So it’s no the same as a free host where you would lose your entire website address, site, etc. They’re a pretty established platform and continue to grow so I have no concerns. But long-term my goal is to sell from both my site and Udemy. The advantage of starting on Udemy is you can build up passive income and let that continue to earn and then also sell on your site so you have two streams of income. About 50% of my sales come from Udemy referred sales. So you can use your audience to build up your initial Udemy sales. Oh and thanks for the link info. Will fix. This is a nice episode indeed. I believe there are so many good and yet to be discovered ways through which one can get relevant traffic with Goggle and a lot of people have been trying to figure this out, i think this post arrived at the right time. I’ve been using Udemy for awhile now but I’ve never hosted any course or tutorial there in order to get some exposure, I’ve just been studying the courses there and also trying to figure out how i can create my own course. I’m going to share this right away, thanks for the awesome information. First let me say that I hope everything ends up working out okay for you health wise. I’m so sorry to hear you’ve had issues, that’s never pleasant to deal with but here is wishing you the very best with what’s ahead of you. Wow, great suggestions and I would have never thought about going local either. Of course what I do and living in the fourth largest city in the US, not too sure how keen they would be on reporting about me but it’s a good thought. Something I think no one ever really thinks about actually. Thanks for sharing those others sites too beside Udemy. I’m not familiar with all the ones that are out there now and I’ve heard so many things about Udemy, good and bad. Just having to be careful about promoting your courses, that alone would make me nervous. But all the different ways you’ve shared with us that we can approach this besides the search engines, well I definitely agree. Thanks for the podcast Lisa and take good care of yourself. I wish you the very best. Thank you Adrienne! I’m doing much better health-wise so thank you so much for the well wishes. Yes, Udemy definitely has its pluses and minuses so make sure you weigh all your options. They seem to be making a lot of changes and I like that they listen to the community feedback. The Facebook group is great, so if you do decide to use them, make sure you sign up with that community. To contact the local media! YES! It’s such a great idea. I think that most people to tend think globally/internationally at first. And that may be overwhelming. Again, this is yet another wonderful podcast! Really, it is worth to implement these tips for getting more traffic to our blog! We are struggling for getting some good traffic to our site. I think only following proper method and implementing them correctly we can get success. I have also written some article about how we can increase more traffic to website daily and got good response form my readers!! Definitely very helpful podcast for every bloggers and webmasters. Another great share Liza. Google Search traffic has become too technical for me so it’s actually best to look for other methods. Thank you for all of the great advice. Your tips and info are always solid common sense solutions. I appreciate your teaching style and your willingness to help others. I hope you continue to feel better and that you don’t have to do the surgery. Hang in there girl! Your posts have always inspired me, this is yet another wonderful piece. This is the most wonderful blog I’ve ever visited. As a newbie I’m still struggling with traffic and how to make money online. So these posts of yours are very useful to me. As usual, great. Thanks for all the advises and am so grateful to have discover your site about 6.5 years ago and have been following you since then. You always deliver. Keep it up girl, you are amaziiiiiiiinnnngggg. Thanks so much for Resuming the podcast….. they are really Productive and Powerful. all relevant content. thanks so much. Hey Lisa. Thanks for sharing another episode with us. Really inspiring.